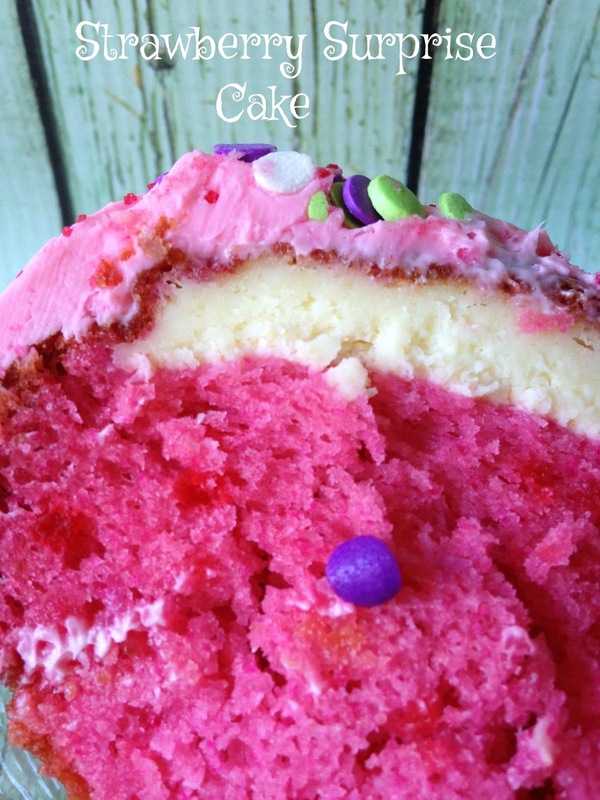 This yummy cake starts off with a packaged strawberry cake mix. 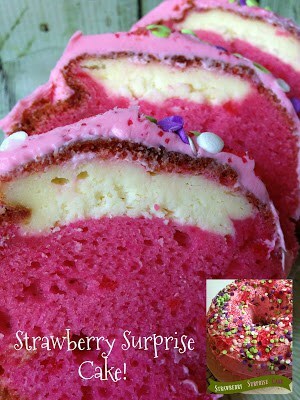 Strawberry extract adds an extra punch of flavor and pink gel food coloring adds that extra splash of color. A few tablespoons of strawberry jam is added to the cake batter adding even more strawberry flavor. 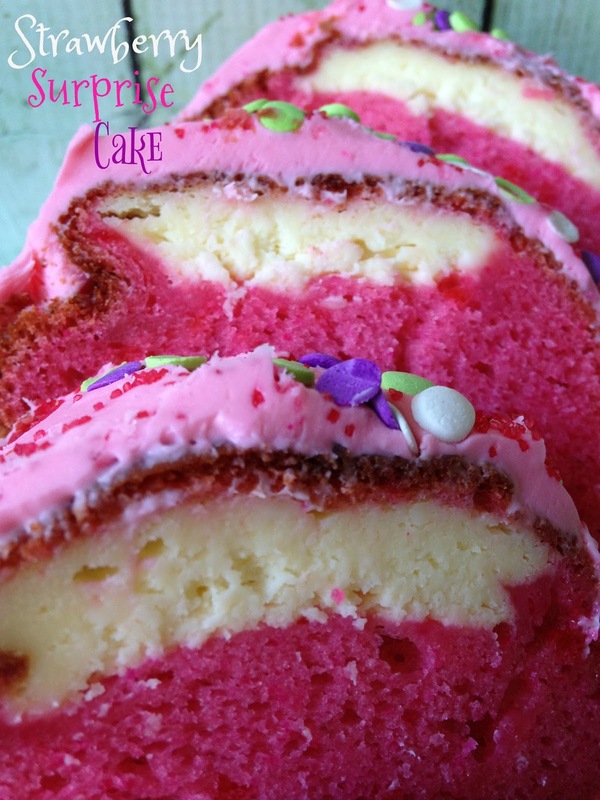 If you love anything strawberry, you are going to find this cake hard to resist. The ‘surprise’ in this strawberry surprise cake is a cream cheese filling. Soften cream cheese, sugar and an egg are beaten together. Half of the cake batter is poured into the bottom of a prepared bundt pan, the cream cheese filling is spooned over the batter, the remaining cake batter is spooned over the cream cheese filling and in about 45 minutes, you’ll have a strawberry cake with a cream cheese surprise in the middle. On top of that, your whole house will smell like strawberries. 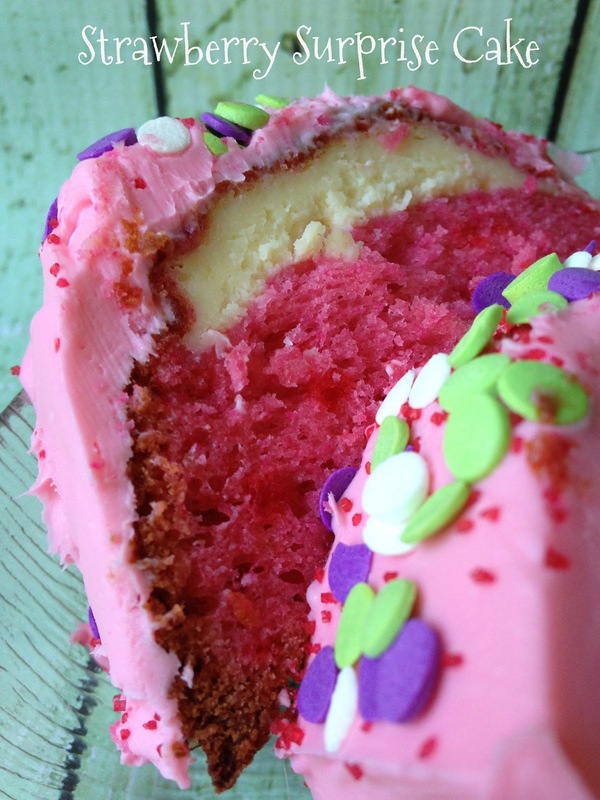 After the cake has baked and cooled, it gets topped with a canned strawberry frosting. To add an extra blast of flavor, stir in a few drops of strawberry extract into the canned strawberry frosting. Some of you might be thinking, “Wow, isn’t that way, way, way too much strawberriness.” Maybe it is and Maybe it isn’t. You decide, but…. 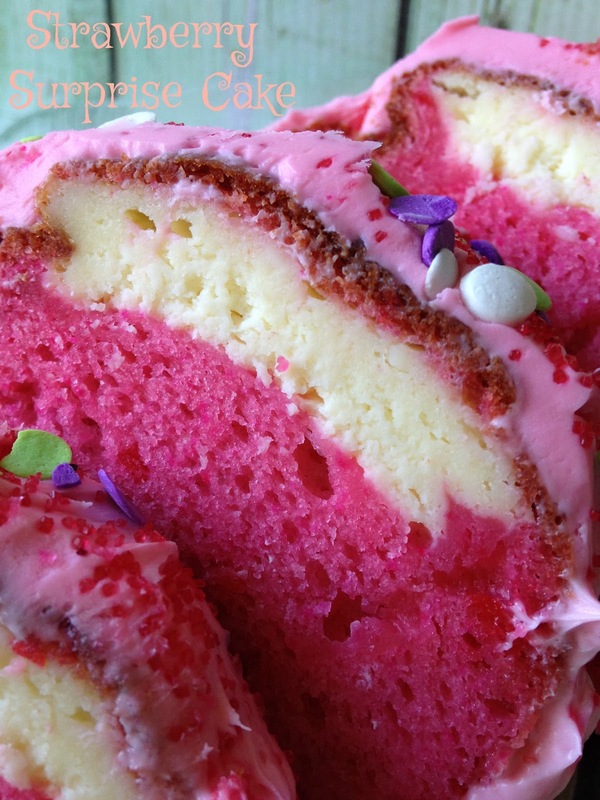 How good does this cake sound…. 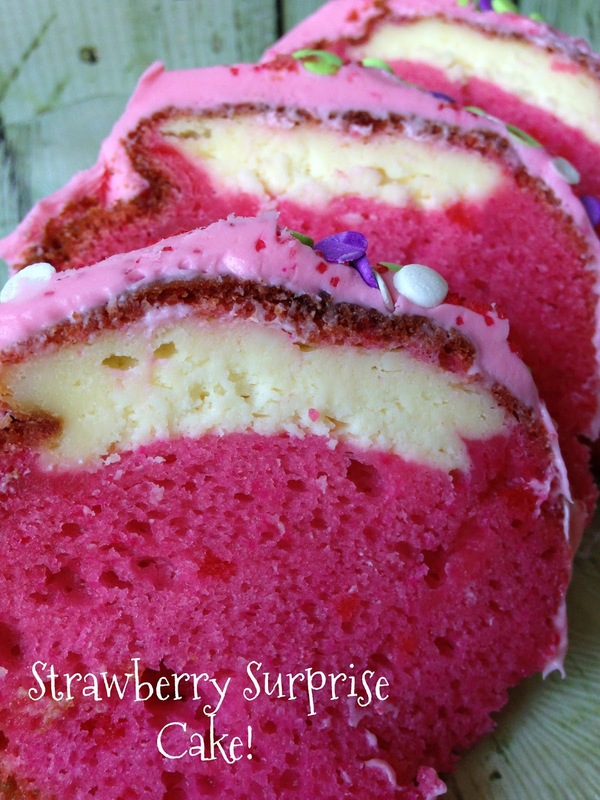 Strawberry Surprise Cake is the perfect springtime dessert. If you’re looking for a Strawberry Dessert to serve for Easter Dinner, this Strawberry Surprise Cake is for you. Serve this cake with sliced, fresh strawberries and a dollop of whipped topping. Grease and flour a 10-inch bundt pan. Set aside. In a mixing bowl, beat cream cheese and sugar. Add egg; mix well. Refrigerate while preparing cake batter. Beat cake mix, water, oil, eggs and strawberry extract in bowl with mixer on medium speed for 2 minutes. Beat in 2 drops of rose pink gel food coloring and strawberry jam. 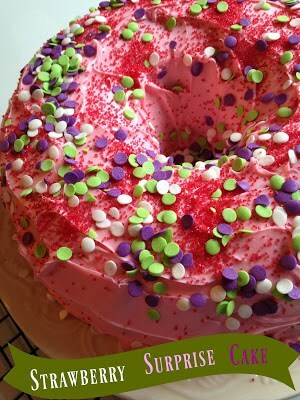 Pour 3 cups batter into greased and floured 10-inch bundt pan. Spoon cream cheese mixture over batter. Top with remaining batter. Bake at 350º F for 35 to 45 minutes or when a toothpick inserted in the center comes out clean. Cool in pan 5 minutes. Carefully remove cake from pan. Cool completely on a wire rack. Transfer canned strawberry frosting into a small bowl. Stir in strawberry extract. Frost cake. Your Willow is just adorable and so is your awesome Strawberry Surprise Cake! Hope you are having a great weekend and thanks so much for sharing with us at Full Plate Thursday! Ooooohh, does that look yummy. Can almost taste it, sweet and soft. So glad you shared this recipe. 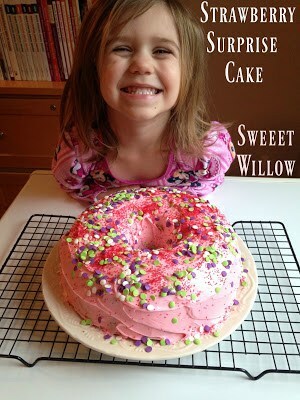 Been getting several Spring recipes this week for desserts, my favorite. As my chubby senior citizen body would tell anybody that's looking, lol. Can't seem to stay away from desserts, need to exercise, work some of those desserts off. Good time to get started walking with nicer weather, no excuses.